Hervé Renard has a problem. He has inherited a team on the decline and there’s little he can do about it. It’s like walking into a job at a small club that has somehow found its way into the top flight with no hope of sustaining it – you can only fall from here. Taking the Ivory Coast job sounds like a good idea in theory. Les Elephants have been consistent qualifiers for Africa Cups of Nations and World Cups in the last decade and they retain many quality players. But much of their success has come courtesy of an outstanding generation of players that are now entering their early-to-mid-30s. Didier Drogba, their inspirational leader, has retired. Didier Zokora, Mr Dependable when in midfield or defence, has also retired. Kolo Touré is also out of the picture, along with Romaric, Jean-Jacques Gosso and Didier Ya Konan. The squad Renard has selected for his team’s upcoming encounter with DR Congo is shorn of much of the experience of its previous incarnation. Yes, Yaya Touré, Siaka Tiéné, Gervinho, Cheick Tioté and Salomon Kalou do bring quite a few caps to the table, but beyond that the party heading to Kinshasa is very young compared to what the Ivorians will be used to, and the loss of influential figures has clearly given the team a mental knock. Time will tell whether this younger generation, which includes Serge Aurier, Brice Dja Djédjé, Jean-Daniel Akpa-Akpro, Ismaël Diomandé and Wilfried Bony, is good enough to provide a seamless transition, but the early signs aren’t positive. A narrow, coming-from-behind win against Sierra Leone was followed by a demolition at the hands of a rejuvenated Cameroon side that has left Ivory Coast in the unfamiliar position of facing a real battle to qualify for the Cup of Nations. And the problem is, with age not on their side, it’s not going to get any better from here. Renard has no doubt been brave in his efforts to distance his team from Sabri Lamouchi’s, which failed so humiliatingly in Brazil this summer. However, is he going far enough? For Nigeria, it took until all the egos and baggage of the mid-2000s generation was removed until they could win the Cup of Nations and become the best team in Africa again. Cameroon are now beginning the same process with promising results so far. These two examples suggest a halfway house solution between two generations doesn’t work. This isn’t to say Renard should drop Yaya Touré, one of the best players in the world. But a decent chunk of the starting XI will inevitably be same old same old. Certainly this was the case against Cameroon – granted, Akpa-Akpro and Lamine Koné were both handed starts against Cameroon, but this was mostly a side made up of players who started games in Brazil, compared to the overhauled, energised Indomitable Lions. It is thus understandable why Sol Bamba has been dropped from the squad – Renard clearly understands that more changes were/are needed. The main question is, is this transition process taking too long, and will it cost them their place in Morocco? These next two games against DR Congo will probably decide that. As for the Leopards, they now find themselves in a position of enormous power. They might have lost to Cameroon in their first game, but after beating Sierra Leone (technically as the away team but on home soil), they now welcome (in the loosest possible sense) a weakened, demoralised Ivory Coast to the Stade des Martyrs. This is an ideal scenario for a team that hasn’t performed to the best of its ability since being dumped out of the Cup of Nations group stage last year. As a result of that poor form, they have slipped under the radar, with all the attention focused on the two ‘giants’ of the group, but they are now ready to pounce. New manager Florent Ibengé is combining his role with that of managing AS Vita Club, who play ES Sétif in the CAF Champions League final at the end of the month. A distraction it may be, but it is also evidence that Ibengé is a talented manager – you don’t fluke your way into a continental cup final. 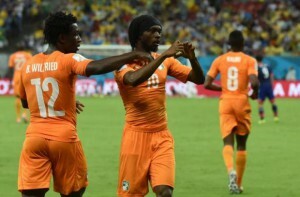 After the departure of Claude Le Roy last year, things seemed to stagnate somewhat for the national team, but the win over Sierra Leone and Ivory Coast’s crushing defeat against Cameroon has given them renewed optimism. That the team has talented players is without question – we all know what captain Tresor Mputu and West Brom midfielder Youssouf Mulumbu are capable of. But to make it to Morocco, they have to pick up points against the two strong teams in the group. If the eternal dark horses of African football are to step up to the next level, this is their big opportunity. The momentum is with them, though, as Ivory Coast are stumbling towards a first potential qualification campaign failure since 2004. If Renard is going to avoid ignominy, he needs to turn it around dramatically, starting in Kinshasa. His reign, and perhaps even his managerial career, depends on the next two matches.